From the Hancock County Courthouse, go on Hwy 16 East for 9.0 miles to Perry Bell Rd. Turn left on Perry Bell Rd and travel 1.3 miles to Jewell Road. Turn left on Jewell Rd. and go 2.2 miles to Mayfield and the intersection with Union Church Rd. Turn right and go slightly less than 0.1 mile past the intersection with Union Church Road to a big two story house on your left next to the old store in Mayfield. The grave is located approximately 150' behind the two story house. 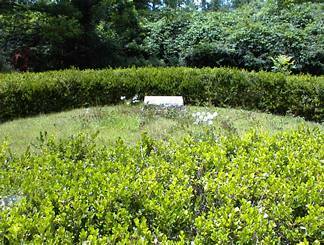 The grave is surrounded by a circular boxwood hedge.